We will not leave you at the curb should you require assistance into your medical facility, or for other necessary appointments. If requested, our drivers will be your attendants throughout your appointment. Medstar’s safe and clean air conditioned vans are fully-equipped to accommodate you and your wheelchair, or use our stretcher; our friendly and professional staff is ready to help in any way. We’ll take the worry out of your transportation, and take you anywhere you need to go. Rely on our comprehensive services for all your Medical Transport needs! Medstar provides you a safe, secure, comfortable and well-equipped means of transportation—whether to or from a healthcare facility, or just for a ride home. 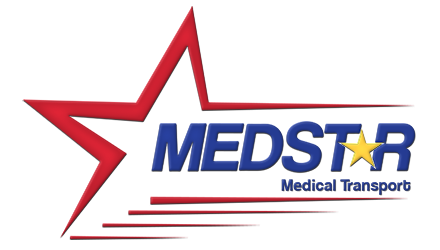 Medstar drivers wear photo-ID badges and company uniforms; are sensitivity-trained, and have backgrounds and driving records reviewed. On time service with continuous feedback available to the client throughout the transportation process. We utilize specialized safe and clean air conditioned vans, monitored via GPS at our local dispatch center for all our local and long distance services. We have both wheel chair and stretchers to accommodate bariatric patients with all equipment rated to 600 lbs. Whether it’s just one transport or several, we’ll provide the most competitive prices in the industry today. We also provide simple, consistent, easy to read bi-weekly or monthly statements. Non-emergency transport for patients that are able to walk on their own or with driver’s assistance. When you’re wheelchair bound, getting a ride to medical appointments or for other reasons can often be difficult. Though friends and family try their best, they aren’t always available when you need them.